The smooth, hard surface of Paris paper is a convenient and economical alternative to bristol board. Brilliant white, crisp, and bleedproof, it is the ideal surface for calligraphy and all fine line pen-and-ink work, including technical illustrations. It renders fine, clean lines with every type of pen, with no feathering or breaking up of lines. 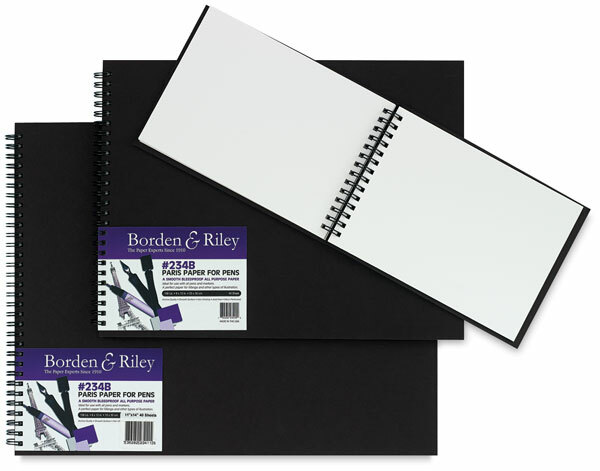 Borden & Riley Paris Paper for Pens is now available in hardcover spiral-bound sketchbooks. Each holds 40 sheets of acid-free, 108 lb (176gsm), micro-perforated paper.